To hit the enemy fast and shoot him to the ground before he is able to hit you. That is all. In the end, all else is totally irrelevant. So, issues about methods and styles, finite accuracy or scores mean absolutely nothing if you cannot hit fast before you yourself are hit. What does it take to do that? First and foremost, regardless of distances involved, you must get the gun into action, and pointed and aligned onto the enemy/adversary. This is totally a physical action relying on such variables as your grip and draw (learned skills), your hand-eye coordination and the ability to focus on and point at an object (an instinctual thing). Second in order, is firing the pistol without disrupting the alignment you’ve created. This involves trigger control and is also a learned skill. Certain pistols may be easier to use in this area than others, but that is another issue altogether. These two simple steps may be sufficient to get a hit on the adversary. This depends on the distance between you and him, which in turn either makes the “target” appear larger or smaller. A larger-appearing target (closer to you) presents a greater margin for error than a smaller-appearing target (more distant from you), and therefore is much easier to hit. The marksmanship problems in real gunfights are not very difficult at all. The mechanics of getting the pistol “out and on”, in other words, drawing and pointing should be the same regardless of distance. I am opposed to the idea of having different draw strokes and different firing positions for the various distances. Some shooting disciplines teach a two-handed position for some distances, and a hip shooting position for others, etc. In my opinion, this creates more variables than are needed. Instead, I favor the concept of having one draw stroke that raises the pistol out of the holster and gets it close to horizontal at the side of the ribs, near the pectoral muscle. This point of transition between “UP” and “OUT” can be a ready position or a firing position depending on your intent and the proximity of threat. The pistol is then extended as needed and can be fired at any point along that horizontal extension toward the target. Notice that I haven’t mentioned the use of the sights at all. This is no accidental omission. I’ll risk disapproval from some by saying this, but at close range gunfight distances (0-15 feet) you may win the fight without ever even looking at your sights. I see far too many students in class take excessively too much time to get a hit on a relatively close and easy target. The reason? They are seeking a perfect sight picture. Not much of an issue on a two-dimensional piece of paper. When that paper is replaced by a moving attacking human adversary either in a force on force problem, or in an actual fight, the time frames may not be sufficient to obtain a perfect sight picture. Thus students must learn through their own training what is sufficient to hit without getting hit. Initially, in any type of combat, the visual focus will be on the adversary. Thus we begin the fight looking at the target/threat. The trick, and its not much of a trick as it comes very naturally, is to focus hard (visually and mentally) on the spot you wish to drive the gun to. Thus where my eyes focus, my mind will focus, and where my mind focuses, my gun will go. It’s the same physical phenomena (or instinct) that allows us to toss a Soft Drink can into a waste basket across the room. It is the same inborn skill that allows you to point something out to someone with your finger tip. Don’t over think it. It is what it is: a natural ability to visually acquire something, visually focus on it and point the hand (or throw something) at it. As I said earlier, the aligning or pointing of the pistol onto the target is a physical act comprised of hand eye coordination, grip, and aided by a directional draw. Let’s not forget the “EYE” part as it’s crucial. Look hard at the spot you want to hit and drive the gun there. Let’s keep that crucial point in mind as it is the common thread that runs through the Modern Technique taught by Jeff Cooper, the Point Shooting systems of Fairbairn, Sykes and Applegate, as well as the lesser known system of Quick Kill created by Lucky McDaniels. 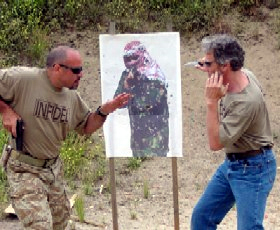 The pistol must be aligned with the target via hand eye coordination and grip. Now if the target is close, as your adversary will normally be very close in most surprise attacks, you need nothing more than this skill to hit quickly. You are not relying on the sights to align anything at all. Good hits can be expected from arm’s length to about 15 feet. As the target becomes smaller, more difficult to hit, or more distant, the more visual verification is needed to make sure your gun is in fact aligned on target. That is what the sights are for. The amount of time you spend on those sights (verifying and making adjustments based on what you see) is proportionate to the distance from threat and difficulty of the shot. Try this. Set up a Teuller Drill with your training partner and Airsoft Pistols. The Teuller Drill involves facing an adversary charging at you from 21 feet with a rubber training knife. The secret to beating the drill is to move as you draw and shoot. Run it a few times and be honest with yourself about what you saw when you broke the shot. I’ll bet most of you will not be seeing the same perfect sight picture you see on a piece of paper. Some may not be seeing anything at all, yet the hits will still be on the training partner’s body. Try it! Good heavens! Am I advocating point shooting? I’m advocating hitting your adversary using whatever it takes, whatever it’s called and regardless of where it came from. Avoid labeling your techniques. Instead do what you need to do to hit and see what you need to see to make sure.